Move over, Pixel, there’s a new touchscreen Chromebook in town. And at just $300, the Acer C720P Chromebook’s finger-friendliness can be had for a mere fraction of the Chromebook Pixel’s $1,300 (and up!) price tag. 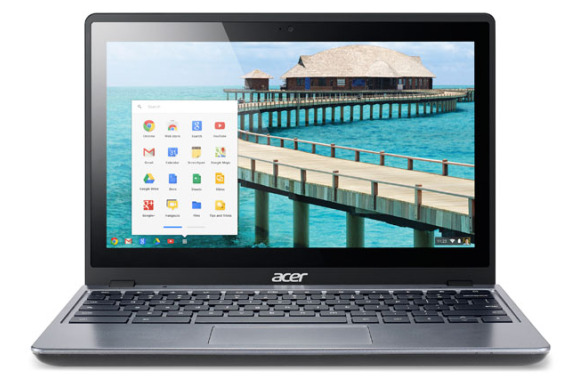 The C720P follows the lead the non-touch C720 Chromebook Acer announced in October, with an energy efficient Haswell-based Intel Celeron 2955U processor, 2GB of RAM, and a fast-waking 32GB SSD augmented by two years of free 100GB cloud storage, courtesy of Google Drive. Beyond Wi-Fi, you’ll find solitary USB 2.0, USB 3.0, and HDMI ports, along with an SD card slot built into the Acer C720P’s slim 2.98 lb., 0.78-inch thick chassis. But those are all just numbers! The big news, of course, is finding a (backlit 1366-by-768) touchscreen in such an affordable device—and the fact that it’s a Chromebook. Google’s browser-centric ChromeOS gets its share of detractors, but the blossoming ranks of offline Chrome Apps coupled with the burgeoning superpowers of modern browsers give these devices more oomph than any old web terminal. Heck, ChromeOS even has the equivalent of a Start Menu, something that Windows itself can’t even claim anymore. And aren’t most of your everyday tasks online anyway? Despite holding tight to the top of the Amazon sales charts, Chromebooks haven’t really moved the needle in terms of volume sales just yet. Nor have touchscreen notebooks in general. But with Haswell, a touchscreen, and that borderline ludicrously low price, the Acer C720P Chromebook certainly seems well positioned to try and change both of those trends. Look for the fingerlicious notebook to show up at Best Buy, Amazon, and Acer’s online store sometime in December.